There are lots of ways to keep your laundry pile under control. For instance, some people do marathon sessions once or twice a week week to keep up. On the other hand, some people hate the idea of dealing with laundry all day long, so instead they do a little each day to keep up. 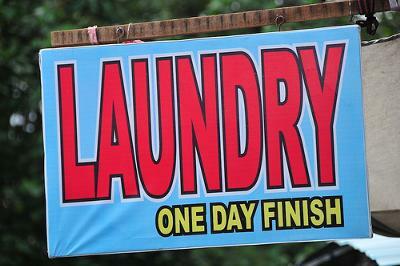 That's what we're talking about in this article, which is about doing a daily laundry routine. Below are examples from real people sharing their daily laundry routine, to give you ideas of how they do it, the circumstances they've got which caused them to choose this method, and why it works for them. As you'll note, many of the routines and schedules you can read below are called a "weekly laundry schedule" and, in fact, they typically are. What is meant by that is that they do some laundry every single day, and plan that over the course of the entire week they'll wash everything that needs to be washed. They typically restart the cycle every week, so they call it a weekly schedule, even though some of the work is done, daily. One thing many of these schedules have in common, but not all, is that many categorize what they will wash on a particular day. For example, they might choose to always wash towels on Monday, bedding on Tuesday, etc. However, you don't have to do this, if you don't want. For example, if you keep forgetting to strip the beds and wash bed linens and blankets, making a designated day for that task will help you to remember to get it done regularly! Remember, what you see below are ideas, but none of them are either right or wrong, all that matters is whether they'll work for you, or not. Get ideas, try them out, find what works best for you and stick with it. Once you've found a good laundry routine make sure you share it here, and I'll add the best ones to the site to help others to get ideas too. If you want to explore other methods for keeping up with your laundry, because doing a load or two each day sounds horrible to you, or you don't think it will work for your lifestyle, I've got lots of other pages on the site which can help, showing lots of methods and real life examples people use for keeping up with the never ending laundry cycle. In addition, you can also get more ideas from my article on making a weekly schedule for your laundry. 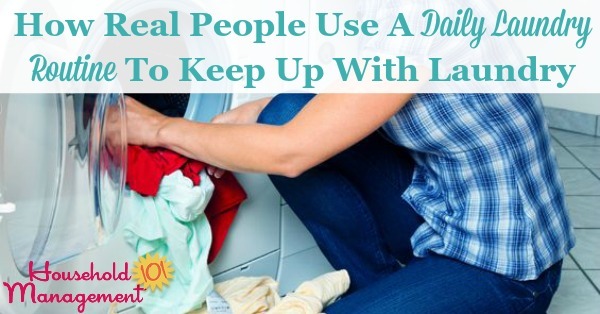 Now scroll on down to see real life examples of how people use a daily laundry routine for themselves! 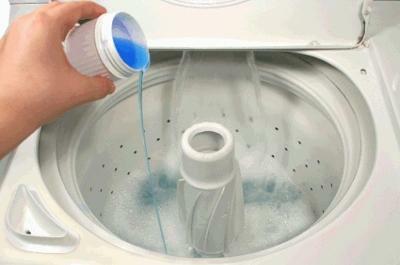 I am so thankful that I have finally come up with a laundry plan that works. Each day (except Sunday) I do one load of laundry. I place it in the washer when the boys get up in the morning. I switch it to the dryer before I take them to the bus stop and during my afternoon cleaning time I fold it, hang it and put it away! Jeanie, thanks for sharing your laundry schedule with us. It sounds like you really have a great plan that works well for you. I especially like the idea of choosing clothes for the week all at once. It does sound like it can save a lot of time. 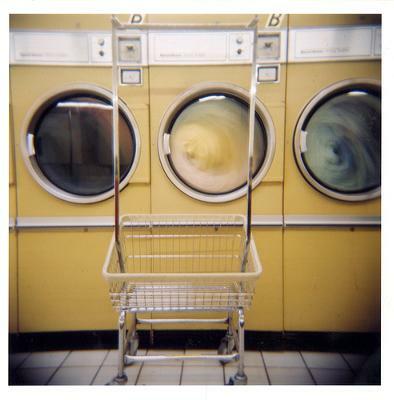 So, does anyone else have a laundry plan or schedule they would like to share? If so, submit your laundry schedule here. Dawn has figured out a laundry schedule that works for her and her family. 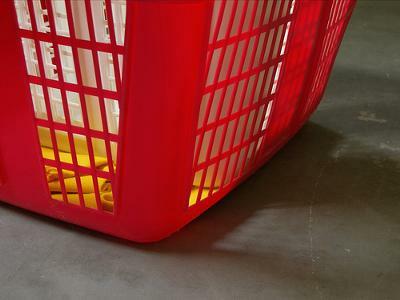 It involves using color coded laundry baskets to sort the clothes as they get put in, making one less step in the laundry process. You should also check out Dawn's idea for how to get the wash ready to go first thing in the morning! I love that she only spends about 10 minutes/day actually doing laundry, but it all gets done! Every morning I turn on the washer, which I loaded the night before. Then I empty the dryer (from the night before) and put away the clothes. Since it's only one load (and I hang EVERYTHING), it doesn't take me long. When I get home from work I flip it to the dryer, turn it on, then make sure that all dirty clothes are gathered and in baskets. We have three big color coded baskets in the central hall, and we don't have individual baskets in bedrooms or bathrooms. The three baskets are on a rolling cart. They are for Lights/Darks/Special Wash. When people undress they either put them in the correct color-coded basket, or (more likely) they toss them on the floor, and I take two minutes to put them in the right baskets each evening. I choose the most-full basket and toss it in the washer, put in the (dry) soap, but don't turn it on -- I'll do that in the morning. Once or twice a week, instead of choosing a basket I'll strip all the beds and wash sheets, or blankets, or the nasty fuzzy floor stuff in the bathroom. On my day off work I might do an extra load. With this method I spend less than 10 minutes a day actively doing laundry (Of course, I'm doing other stuff while it's actually washing or drying), but there are always clean clothes, beddings, etc. 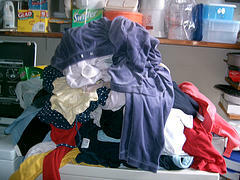 A reader, who is a work from home Mom of 4 older kids has shared her laundry schedule with us. What works best for me is that since my kids are older (10,13,16,18) I have assigned each of them a laundry day where I will do there laundry. They must bring it to the laundry room one on Monday, one on Tuesday, one on Wednesday and one on Thursday along with their bedding and towels. I will wash and fold them and have them ready for them to take back to their rooms that evening. IF they do NOT bring them down, they are responsible for doing their own laundry that week and only when I am not using the machines. Thanks for sharing your laundry schedule with me. I really like how you put responsibility on your kids. Once our children get old enough to help they really should, just like you require, because it helps us, the rest of the family and themselves. Have you considered having them do their laundry all the time though, and requiring them to get it done that day which is already assigned? Perhaps it would work for you, perhaps not, but it is something, at least in my opinion, to consider. I do three loads a day minimum, one of clothes, one of towels, one of bedding. I will also do more as needed. It works for me because if I don't do that much each day we are swamped. 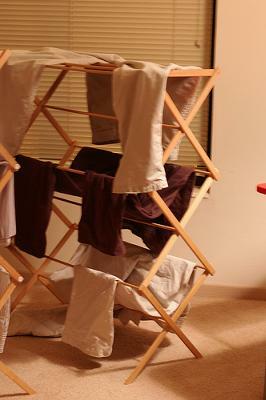 Have to do lots of laundry, but don't want to use a dryer? Christy shares how she does two loads of laundry a day and saves electricity at the same time. I don't really have a specific schedule other than two loads a day. I determine what two loads need to be done by looking at what there is to wash. The reason I do two loads a day is because I have two drying racks (we've been avoiding using the dryer so much as a trade off to using the air conditioner - trying to save electricity). Most days I do one light load (underwear, socks, towels, dish cloths) and one dark or colored load. I try not to do any load that is not full unless absolutely necessary. Bed linens are done once a week and hung on the outside line so I try to pick a weekend day (when I'm not working) that is nice weather. Otherwise, those items are done on Monday. My biggest issue is keeping my 5 year old from tossing clothes that really aren't dirty into the laundry. I have found that if he doesn't want to put something up or if he has only worn something for an hour or so, he wants to wash it. We will be working on getting that straightened out over the summer with some better consequences for tossing things that truly aren't "dirty." So, that's how Christy does it -- I think she has some good ideas. I also know what she means about kids throwing in basically clean clothes to wash again. It can be maddening. Anyone have some good suggestions for how to fix that problem? I know I would love suggestions. I'm a Mom of 3 who rarely uses a dryer. I live in cold SD in the winter, but use my basement and a fan with clothes on drying racks. Just as the clothes are barely damp (very very close to dry), I throw them in the dryer for the final 3 minutes to "fluff them up" and dry them. Also, I only use the fan when I want to speed up the process, it uses less energy than the dryer. To get kids not to put clean clothes in the laundry, I would tell them what they could put in the laundry before they went to their room for the night. I explained why. Sometimes they don't understand why until they are 9-10. Takes a few seconds, but I chose my battles before they started. My youngest is now 18 and oldest is 31 with 3 children and doing this too. Good luck! I do not use laundry as a punishment. Each child (I have 5) has a day during the week for laundry. They do their own laundry. If you skip your day or do not have enough to make a full load, there is always Saturday and Sunday. My youngest is 9, my oldest is 16. We have been doing it this way for several years and it seems to work best. We also save electricity by hanging clothes to dry in the laundry room during the Winter and on the line in the summer and drying only socks and underwear in the dryer. I have four children (all boys) that used to create tons of extra laundry for me this way. At wits end one day, I announced that whoever continued to do so was going to buy themselves the responsibility of doing all the laundry for a couple of days. Sheree had become overwhelmed with laundry, which is easy to happen in a family with 1-2 children, but when you have five kids even more so. This is how Sheree has helped herself and her family to get control over Mt. Washmore. I used to be really bad with laundry. I was very particular on how it was supposed to be done. I would separate the whites, towels, lights, darks, delicates and then other things like stuffed animals and such. It was tiring! I felt I had to bleach the whites and with my towels I had to wash on my sanitary setting. I finally researched the whole thing and found that as long as the colors didn't run I could wash everything together. It comes out clean. I promise. With 7 people in the house I do about 2 loads a day. Every child has a laundry bag and is assigned a day of the week. In the morning they are resposible to bring their bag into the laundry room. Thanks for sharing your laundry routine Sheree, and also for explaining how you fixed that feeling of being overwhelmed by your laundry. I know many of us (including me) have experienced a similar feeling from time to time. Nice to know that certain routines and actions can make it better! Now that you have read how Sheree has done it, what about you? Do you have any tips to share? I am the same way...very particular about how its DONE!! BUT I have become SO backed up, its ridiculous...SO I am taking this & running with it. With 5 kids, who are getting older, there is NO reason they can't be responsible for dragging their own laundry downstairs once a week :) Thanks...I will post MY new laundry schedule as soon as possible! Melissa has shared her family's weekly laundry schedule with me, and also why this schedule works for her. 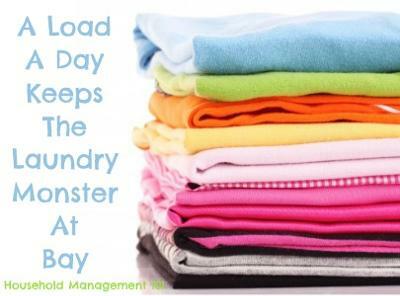 This works for me because it is one small load each day that I can wash, dry, fold (or hang up) and put away. It also gives me my Sunday's free. Nothing ever gets piled up and I can cater each day to the load. Thanks so much for sharing your laundry routine Melissa. I noted that you mentioned that the advantage of doing just one load per day was being able to complete all the steps in the laundry cycle, which I think is very important. If you let any of the steps pile up, such as not folding, or not putting away, a daily system will eventually not work well because things will still pile up! Robin, as a mother of four, faced a challenge: how to gather up all her kids clothes to wash when she does all the laundry herself? She uses a method I suggest, having just one area to put dirty clothes, like one or more laundry baskets all together, instead of spread out in each room, when you are doing everyone's laundry yourself. With four kids (ages 21 down to age 5) and a husband I wash at least one load of clothes every day. Everyone puts their dirty clothes into a hamper in the bathroom, and with 6 of us it fills up quickly. I generally sort between darks and lights, but have been known to combine everything together if I need to get enough clothes for a load. I put the load in before I start dinner, and then switch it to the dryer before I go to bed. It is a bonus if I switch it soon enough that it is dry before I go to bed. If so, then I go ahead and fold it and put it away. If not, then I do that in the morning. If I didn't do laundry every day it would quickly overwhelm me, so this is what works best for me and my family. Thanks so much for sharing your daily laundry routine Susan. That's all of the laundry schedules and routines I've published so far where people like to do a load (or more) daily to keep up with their piles of dirty clothes. Remember, if you've got a laundry schedule or routine that works for you, I'd love to hear it, whether you use a method similar to those above, or not. You can share your own schedule here. In addition, don't get discouraged if these methods and laundry plans didn't feel like a good fit for you. You can find something that works for you. 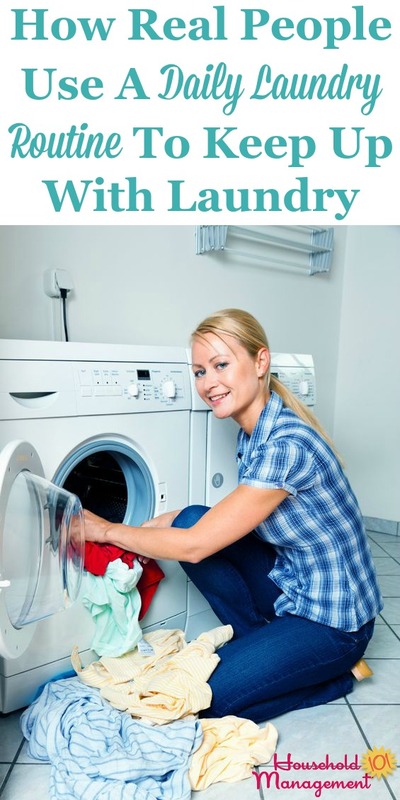 Go ahead and read my article on making a weekly schedule for your laundry here, and also check out these additional laundry plans submitted by other readers. I have never enjoyed laundry and don't know what to do when I have kids, but I've gotten away from the once a week deal because it is too much. What I TRY to do is wash a load at night, dry it over night, put it away in the morning. Sometimes I have more laundry than usual and may end up with 3 loads on Saturday so I put music on and while clothes are washing I do my weekly chores (mopping, etc.) while folding/putting away in between. My husband will sometimes do the putting away if I wash/fold. I think it should be 50/50 since we both work full time and it's working out well so far. 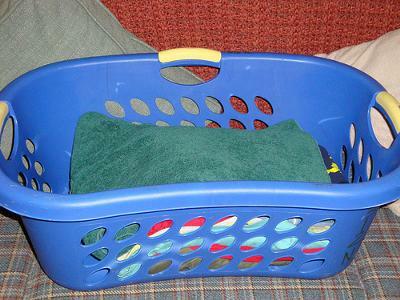 When I wash and dry them I have laundry baskets for each and fold as they are done and then before next wash day I empty baskets. 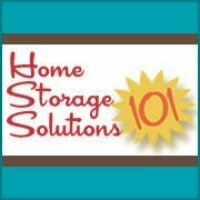 This has helped with not having to fight over who gets their laundry times, no hassles or complaints of everyone needing the washer and dryer at the same time. I was raised in a house without plumbing. Monday was washday, pumping and heating water in a boiler. Wringer washer with a rinsing tub. Dish towels were soaked in a small bucket with bleach. Then underwear. Fish towels and cloths were never washed with underwear that hadn't been sanitized. First load whites, then loads of sheets, next towels followed by dark clothes, work clothes, rugs and rags. I did this myself in my early marriage years. Efficient and DONE. Life changes, more kids, a full time job and an automatic washer, and later a dryer! I still had a routine of Saturday morning running all the sheets through so bedrooms could be cleaned. Then a few loads of clothes and towels. Sunday evening ironing. On Wednesday as needed with 5 kids, they didn't have tons of clothes. As the kids got older they did a lot of their own laundry. Never out of control or overwhelming. Don't wash clean clothes! Jeans are usually good for more than one wearing. Bath towels can be reused if hung up. I have a husband and 2 sons (20 and 14). 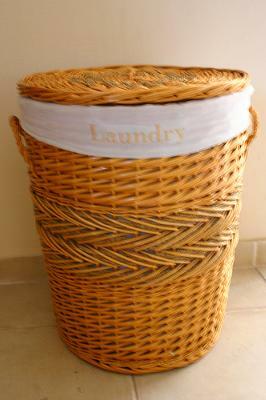 I have four laundry baskets - whites, lights, brights/darks, and jeans. In the morning, after I've showered and dressed, I choose whichever basket is most full and wash that. If none are really full I get the day off. On Mondays, when I clean my bedroom, I wash our sheets and on Tuesdays, when I clean our bathroom, I wash the towels. The boys wash their own sheets when they clean their rooms on Fridays. My older son does his own clothes. I do one to two loads of washing each day. Sunday sheets, Monday bathroom, cleaning and kitchen towels, Tuesday my work clothes (one small dark and one small light), Thursday hubby does 3 sets of his work clothes, Friday misc mixed general clothes. Saturday 3 set of hubby's work clothes. I set my washer on time delay to be ready to hang in the morning. I fold and put away while cooking dinner...done! It's not what you would call fun, but having a schedule helps! I am teaching my granddaughter, whom I am raising, a daily routine to carry with her throughout her lifetime and her own household. Every morning she takes a basket of clothes to the laundry room, sorts them, and starts a wash. She then unloads the dishwasher and takes out something for dinner. Afterward, she tidies her room, gets dressed and goes for her morning walk. On the way, she feeds the animals and lets out the chickens. Back inside, she eats breakfast and transfers the clothes to the dryer. By now, it's 9:00 am and she starts her schoolwork (she is homeschooled). School until noon when she breaks for lunch. After lunch, laundry is hung/folded/put away. Because this is a daily routine and a manageable load it is not overwhelming. We have tried several different approaches and find this works best for our lifestyle. I have three hanging canvas bags. One is white, light colors, and darks. Each day I check and do the one that is the fullest. My towels, sheets, and blankets go into the bags as used or changed. This makes my laundry simple. I put the load in as part of my bedtime routine and my hubby (who gets up at 3:30) puts them into the dryer. My morning routine includes going through the dry clothes and hanging or folding and putting mine away. Hubby's go on his side of the bed and he hangs or folds and puts his away. Towels and sheets are part of my folding. This works great for us and has become quite routine. Still doing kids' laundry? Really? I love your suggestions and I enjoyed the readers' solutions to the laundry monster, too. Two things have made my laundry life immeasurably easier: 1) I took the time to teach our son to do laundry as soon as he was tall enough to reach the dials. So he's been doing his own since he was about 8 yrs old. In my opinion, no child over 12 should still be having laundry done for them. 2) early in our marriage my husband let me know he could not care less about having his socks and underwear folded. So we have a 'clean' basket and a 'dirty' one for all his whites. When the dirty one is full, wash, dry, dump in 'clean.' Ta-da. Saves me at least half an hour. Thanks again for your sites! I am lucky because my children are grown and gone. Our master has two small walk-in closets. We have used every inch of the closet floor. Despite having a set of a small chest of drawers and two laundry baskets in each closet. We sort our clothes as we take them off. Four baskets: delicates, darks, lights and whites. Every morning when I get up and look at the basket. If there is one that is really full, I put my robe on and put that laundry in the washer. I always check for stains so I pre-treat any spot. After they are folded, put them on hangers and I am done. I wash towels twice a week. TIP - throw the dirty towels on the floor and immediately hang up clean ones up. I always forget that part. People will thank you. So, I do about 5-6 loads a week. Definitely like the daily approach and allocated days. When I have a designated day to wash towels or sheets I know I will have room to dry them (either outside or in dryer) because they are not competing with clothes.You don't have to stick to it all the time, but it's a good indicator for deciding if you have enough clothes for a particular person, if they can't go a few days without you washing for them, and a helpful reminder to wash bath mats etc that might miss out. I love your idea on separating the laundry into 3 colored baskets for the whole family to drop their dirty clothes into when they undress. I am going to use your idea, except I am going to put 3 color coded baskets in my son's room and one in mine and my spouses closet. Since my DH and DS are extremely messy and disorganized, I feel like if the baskets are close to them, they'll be more likely to use them. Thank you for posting how you get your laundry load put in the wash at night so it will be ready to wash in the a.m. That is a great idea. I plan on using that idea as well. Thank you so much! Your suggestions are going to really help me out. Hi, I have 3 teenage daughters and a husband living at home. I work full-time. We are lucky enough to have two washing machines, because a friend offered me one for free and I had space for it so...I put it in. Now, I'm thinking I'll never go back to having just one washing machine. For instance, when your washing machine breaks down....how inconvenient it can be to have to have to use someone else's or go to the laundromat?! Our routine involves washing daily, hanging out on the clothes line if weather permits, bringing in, folding immediately and MOST IMPORTANT OF ALL is getting the family members to put their clean washing away EVERY NIGHT before going to bed. The sooner the better. When I get home from work at 6pm, I bring in any washing that the family has neglected to bring in (still trying to get them to initiate this themselves), sort, fold and place on their beds. Then I tell everyone to please put it away immediately. We have been down the road of not putting away clean clothes, then the pile ends up on the floor when we go to bed, then the dirty clothes get mixed up with the clean clothes and the pile is destroyed by someone looking for clothes and it all ends up in the wash again. But I have decided that is not going to happen any more. So, putting away clothes immediately is the only solution. But gee, it's worth it when you get up in the morning and go to your wardrobe and can actually FIND what you want to wear!!! I just want to know really about space. Me and my son are having a disagreement over if we each had a basket who could put more clothes in the basket, me by just stuffing them in unfolded or him by folding the clothes. Which basket would hold more, unfolded or folded clothes? Brenda, the answer is that folded clothes take up a LOT less room than unfolded clothes. Therefore, you can fit a LOT more clothes into any container, be that a drawer, laundry basket, or whatever, when they're folded neatly. Don't believe me? Check out my article about how to fold t-shirts, and how it provides a lot more room in your dresser. If they need responsibility, doing their own clothes is much better than just bringing them for you to do. You deserve time and respect! I have an integrated laundry/housework schedule, because I work it keeps things from piling up on my day off, always off on Tuesday and Wednesday, so plan is just for fun Tuesday. Monday I strip the bed and put sheets in before work, come home put in dryer and tidy room before making bed with clean sheets. Tuesday is funday, I wash my fun clothes, usually cold water clothes, before going out the door, no other chores, except hang the clothes out to dry when I have a moment. Wednesday I prepare for Thursday's trash pickup, no laundry, but run errands and do meal prep for the week, taking out the trash after my mess making. Thursday is towels day and general dusting, vacuuming, and mopping. Friday is workwear day and take care of car, purse, work bag and guest room. Saturday is miscellaneous day for laundry, tidy up the general areas of the house that don't seem, in my house to need as much attention, den, entries, living, and dining rooms. Sunday is devoted to the kitchen and menus, run the dishwasher, clean out the fridge, and check the pantry for shopping day. I am a little nutty and actually really enjoy doing laundry (and vacuuming, cleaning counters, etc. It is kind of like free therapy). I do multiple mini loads every day, sometimes up to four per day. My boys (ages 14 and 12) can sort and start the laundry, but I flip it to the dryer to intercept hang dry items. Before they go to bed and when they wake up, I give them mini-stacks of clean laundry to put away. Sunday is ‘sheet day’ in our house, and I try to get all of the sheets laundered and put back on the beds before we leave for church. Thursday is rug/hand towel day, and I wash all of the throw rugs, bath mats, guest and 1/2 bath hand towels. Our regular towels get washed after each use, so those are in our daily miles. I have found sheet day much easier now that all of our beds have white/ivory sheets. The boys sheets on their double beds can fit in the same load. I had our trim carpenter build a very attractive hanging rack in the laundry room for our clothes that we hang to dry. I am also able to use this for the kids shirts, so I can immediately hang them when i pull them out of the dryer. This saves ironing time! I like to use the steam refresh cycle on the dryer with a wet rag to ‘iron’ and t shirts that sit still in the dryer and become too wrinkled for school. I iron on an as needed basis and keep the iron and board in our master bedroom closet for last minute pressing.